Netflix‘s Nappily Ever After does a genre switch on me, and subverts every expectation I had from watching the trailer. I expected a clichéd romantic comedy, instead I got a discussion about womanhood, identity, and the realization of self-worth. The movie definitely sets itself up with the best of intentions, but doesn’t succeed nearly as much as it could have. On her birthday, Violet Jones (Lathan) goes into the celebrations expecting her 2-year boyfriend (Ricky Whittle) to propose. When he doesn’t, she feels her carefully curated life start to unravel, leading her to explore who she is, and what she even wants in a man, in her job, and in her life. Nappily Ever After was initially slated to roll into production in 2003, with Halle Berry at its helm. Somehow it never got moving, and in 2017 Netflix announced their undertaking of the movie, with a new cast and writers. 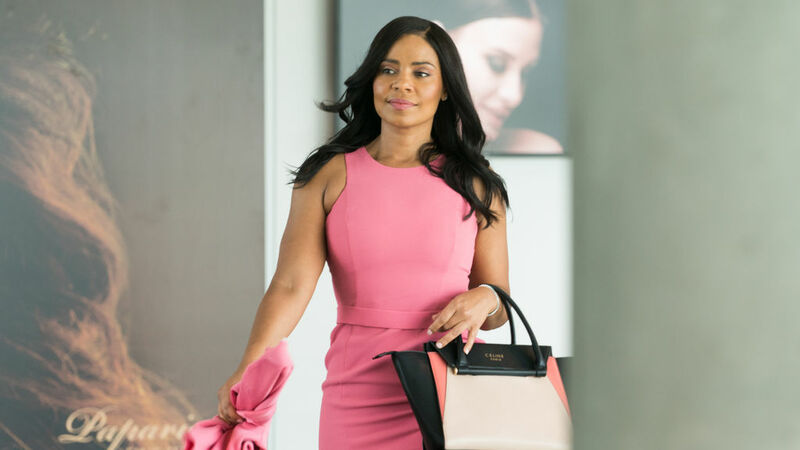 Sanaa Lathan, who plays the protagonist in the movie, is also a producer. For the role, Lathan actually shaved her head, thus giving that moment in the film a sense of authenticity. Having spent more than 20 years in the business, Lathan is proud to be able to tell the stories of black women, and women in general. The only reason why this movie succeeds in some sense is due to the talents of Lathan, who delivers a protagonist I relate to and can root for. She is beautiful in whatever she wears and however she looks, and this is a good thing. It encourages young women to see how important it is to be comfortable in your own skin, to recognize that beauty is a multifaceted thing, and not something fixed in stone and out of reach. As a woman with curls I cannot control, I related very strongly with Lathan’s struggle regarding her hair. We are consistently shown that hair needs to be tame, straight, shiny, long, for it to be beautiful. We only need to take a look at the Miss Universe contestants to realize that this is a mold of beauty society holds on to. To have short hair would be to look like a man, to have textured hair makes you look untidy and unkempt. This notion is reinforced by Violet’s mother (Lynn Whitfield), who helps her straighten her hair so it never manifests to its true glory. Her actions are a result of what was done to her in the past, thus enforcing a myopic state of perceived beauty onto Violet. Perfect hair would grant Violet beauty, and with beauty she would get the man. A random woman at the hairdresser, while she stares at her newly cropped short hair, comments that men like women with long hair (she specifically says “the brothers”). This has been my observation as well, with women clinging on for dear life to their lengthy strands because that’s apparently what men want. So I love that the movie structures itself around her hair, with different chapters named after the different hair styles/types she dives into. Her hair journey thus becomes symbolic of her own journey to self discovery. While Lathan plays her role well, I can’t say the same for her male co-stars. Clint, Violet’s big shot doctor boyfriend, is hot but boring. It makes us wonder why Violet is even with him in the first place. Will the hairdresser (Lyriq Bent) fares better, but he too gives up far too easily on her. The white guy who Violet tries to hook up with is so vanilla and bland, so much so that I have to ask myself, is the telling of female centered stories resulting in a lack of development of our male characters? Are they relegated to love interest and a mere plot device? Yes the main story being told is Violet’s, but her story is only as effective as the characters who are helping to support it. I will say this: Lathan has strong sexual chemistry with both men. I had to turn away a little because the scenes were so intense and made me feel like I needed a cold shower after. While Violet’s mother fixes and tidies her hair, Violet does the opposite with Zoe (Daria Jones), the daughter of Will. She encourages her to be confident in her looks and hair, not to buy into what society sells as beauty. Zoe becomes a daughter of sorts to Violet, and I enjoyed their scenes together. Zoe’s real mother is an absent figure, so Violet is able to slip into the maternal role quite easily. Ultimately, we develop our self-image from our mothers. Violet’s mother’s obsession with perfection and appearance became Violet’s obsession as well. She is finally able to let her hair down (I just had to use that pun) and come into her own, but she wonders how she would have been if her mom had nurtured acceptance, instead of appearance. I liked the movie. It was more than I expected it to be, and really considers what it means to be a woman. I can’t however, say that I love it. There is this whole subplot with her father wanting to achieve his dream of being a male model. I am not too sure what its function is, besides trying to show what a control freak her mother is. The supporting characters are weak. We never learn much about her two besties, whose sole purpose seems to be Violet’s troop and support squad. They don’t appear to have lives of their own. The advertising world seems to be filled with moronic white men who cannot see beyond their myopic perspectives, with an Asian woman whose opinion never seems to matter. Is the presentation here too hyperbolic? Are women consistently rallying against the odds? It just didn’t seem real to me at this point. 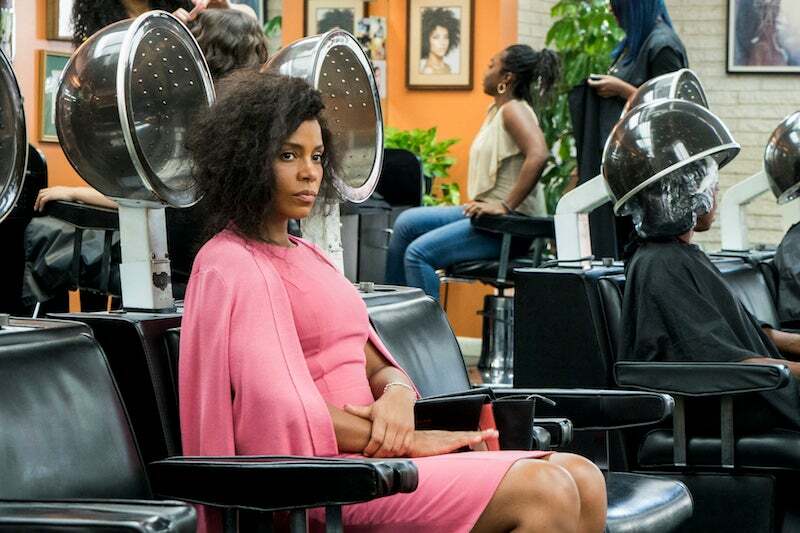 All in all, I feel Nappily Ever After is a movie that looks good on paper and tries very hard, but just misses the mark. Thank you for reading! What did you think about Nappily Ever After? Comment down below! Great review my friend. Reading it let me know what kind of movie this is. Aka the type I stray away from. HAHA! Oh come on, I am sure you enjoy a good romantic comedy from time to time. I am more envious of the fact that you get to review Johnny English. How was it?